interest in this years Raid, to keep you informed of progress. There is all tide access in and out of Shotley. Haul up on beach, packed lunch at Stour SC. chips at Harwich & Dovercourt SC. Back to Shotley Marina before dusk. Royal Harwich YC marina for people sailing Sunday. Camp moves to Woolverstone if desired (or can stay at Shotley campsite). This entry was posted in Cruising on June 20, 2012 by Tim. I have a YW dayboat in Croatia and now have permission to put in a mooring here for my boat. I’ve had a look online and there is a lot of conflicting advice, although this may be due to differing conditions. I have a few questions below, if anyone can advise me that would be great. It will not be a swinging mooring – there will be a buoy to tie up to and then the other end of the boat will be tied to the shore. There is essentially zero tide here. Q2) I understand the benefits (density) of using iron/granite over concrete but practically concrete is probably the only option here. What size of concrete block should I use? The local guy I spoke to just said fill an old car tyre and that should be enough but that doesn’t seem big enough to me. Q3) Do I need to put reinforcing bar in the concrete block? Q4) Most of the mooring failures I read about cite shackles as the culprit. What is the best way of connecting the ground chain to the block/anchor? Q5) What is the minimum length of ground chain and rope I should use up to the buoy? 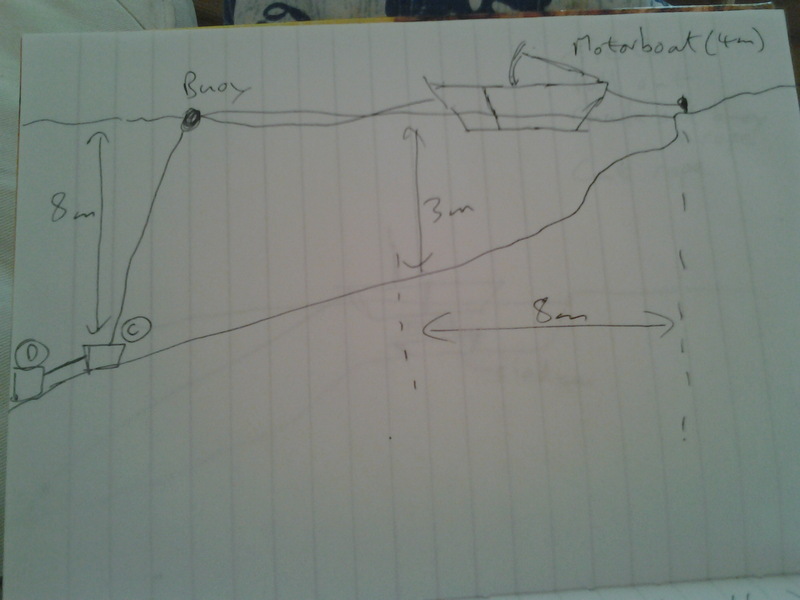 Q6) Infrastructure is very limited here so I am probably going to have to transport the block from the shore to the mooring point (about 20metres) using my dayboat. I’m probably going to cast a series of concrete blocks with holes in the centre and then chain them together in the shallows, as otherwise I won’t be able to move a single block. Any ideas on how to sling/lift the blocks in the shallows and then lower them in a controlled manner would be helpful. 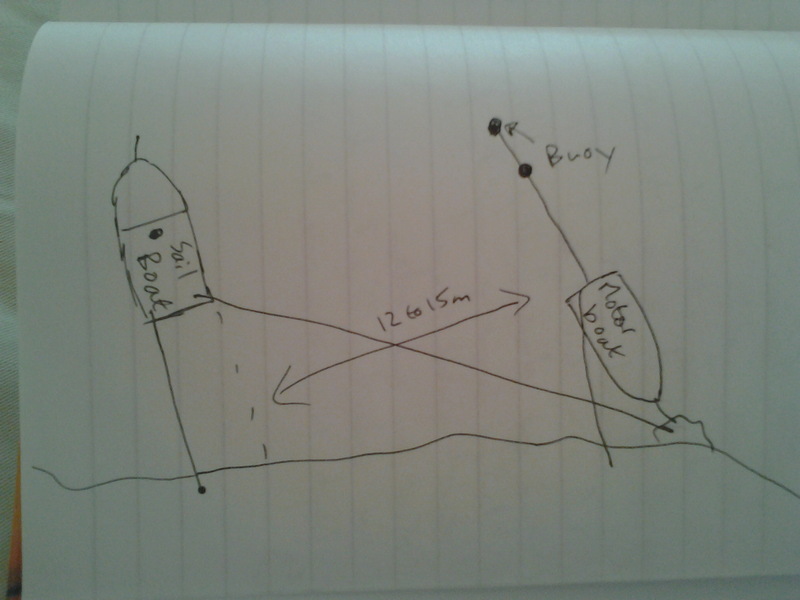 I dived down today to look at the way my neighbours boats are moored and they differ – one uses a large block and the other uses two ropes, one connected to a grapple anchor via a block and the other one went too deep for me to see. The first one is a motor boat which is slightly larger than the dayboat and the second one is a sailing boat with a small cabin, bigger again than the motor boat. 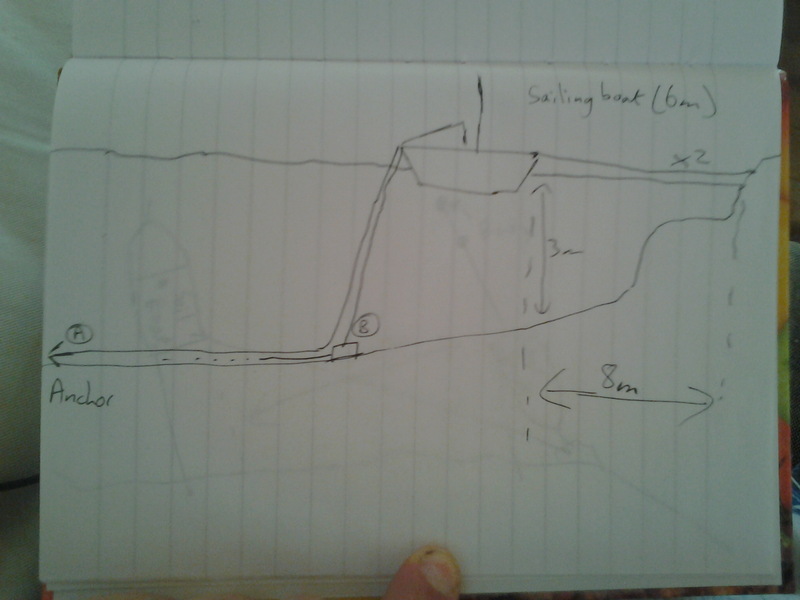 I’ve done some sketches below of the situation as well which might help. I reckon block C for the motor boat is a cube 50cm in all directions. This entry was posted in Moorings on June 17, 2012 by lizzyanne. In July 2010 Jane Trowell and James Marriott sailed their smooth hulled DB 588 (with borrowed sails), Isis, from the Crouch and Roach rivers through the Havengore Gap into the uncertain waters of the Thames. This entry was posted in Cruising on July 25, 2011 by Tim. lunatics from Gravesend SC led by Penny, are planning a DB cruise along the Caledonian canal, starting aprox 22nd July 2011. We are intending to tow the boats to the western end of the canal to the start. (aprox 500 miles ) Other club members, friends family etc, might be camping, bed and breakfasting or bare boat chartering along the route. The canal is large and has no mast lowering to contend with. Please let any DB enthusiasts know and ask them to let me have their email so that I can keep them informed of our plans. This cruise is in its infancy and the dates have been planned to allow plenty of time to return south for DB Nationals. I hope that lots of people will be interestd, and if all goes to plan we should get some good publicity. This entry was posted in Cruising, Publicity on December 29, 2010 by Tim. This entry was posted in Cruising on March 20, 2010 by Tim.